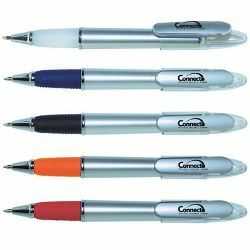 Plastic pull cap ballpoint pen with thick grip. ITEM SIZE(MM) 116L x 13D. PRINT AREA(MM) Pad Print Barrel - 50L x 6H, Clip - 35L x 5H, Roll Print Barrel - 40L x 32H. COLOURS Silver/Black, Silver/Orange, Silver/Red. (Silver/White, Silver/Blue discontinued).